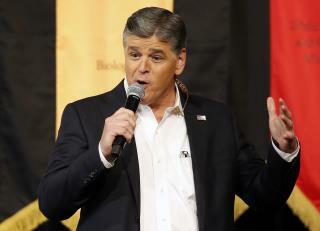 (Newser) – Sean Hannity isn't just feuding with Glenn Beck, apparently. Twitter was in awe Wednesday when the Fox News host slammed fellow host Megyn Kelly with "what he might consider the worst insult imaginable," per USA Today: He accused her of "clearly" supporting Hillary Clinton. Earlier Wednesday on The Kelly File, Kelly had criticized Donald Trump for avoiding tough interviews. "Donald Trump, with all due respect to my friend at 10pm, will go on Hannity, and pretty much only Hannity, and will not venture out to the unsafe spaces these days," Kelly said. However, she also made the exact same criticism of Clinton. Hanitty is right Kelly is another Katty Couric in heels that is a shallow liberal posing as a conservative journalist. Every opportunity she can she attacks Trump. Her hyprocritical posturing condemnations of sexism while talking slutty on Howard Stern and posing in revealing garment says it all. She is a loose cannon that needs to be dumped. The recent Kelly and her judge act defending Bill is pure Clinton propaganda. Laura Ingram is a much better interviewer and has a grasp on reality. Enough with the liberal mean girl in high heels act and time for real journalism. Most Media are bloviating wipes with a agenda under the guise of impartiality.